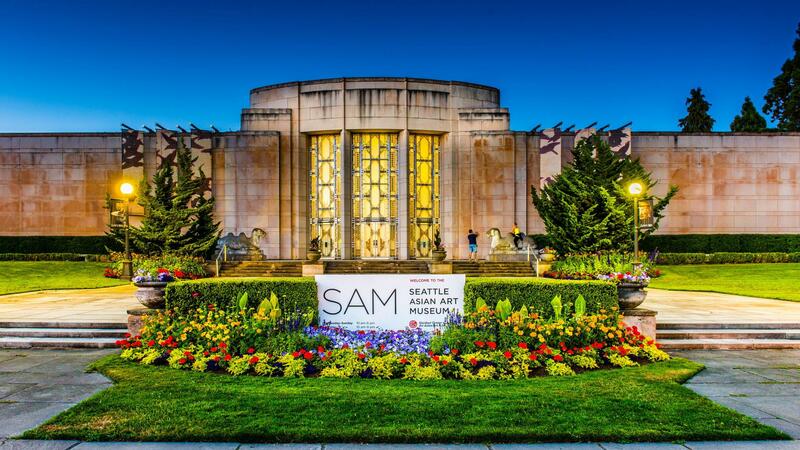 Rent Seattle Asian Art Museum | Corporate Events | Wedding Locations, Event Spaces and Party Venues. Located in lush Volunteer Park, the Asian Art Museum is a historic Art Deco building featuring a world-renowned collection of Asian art. Take advantage of free parking, the Seattle skyline view, and nearly 50 acres of beautifully manicured park lawns and gardens. • Up to 200 guests for a standing reception or 90 seated at round tables. • Option to add access to adjacent galleries for private viewing. • Includes access to Front Terrace for wedding ceremony, weather permitting. Indoor ceremony options are also available. • The front grassy lawn and other outdoor sites within Volunteer Park can be reserved through Seattle Parks and Recreation. • Up to 150 guests for a standing reception or 90 seated at round tables. • 219 fixed theater-style seats. • No food or beverages inside the room. • Add private access to SAM’s beautiful collection of Asian art. • Enhance the experience with a guided tour led by a knowledgable SAM docent. • Parking is complimentary throughout Volunteer Park and in nearby residential neighborhoods on a first come, first served basis.